In this article by a history department professor and his student, the writers argue that it is necessary for university students to be taught a more robust atheism in order to be able to refute the beliefs of sectarians and cultists. It is not enough to be an atheist; a young educated person has to know enough about religion—Christianity—to be able to make a logical argument against it. The authors suggest that comparing what is written in the gospel Mark to what is said in Matthew and Mark about the same instance will act as a wedge. The believer must choose among apostles as to whom to believe. Thus is doubt provoked. Knowing these “little things" about religious doctrine and practice can be more effective in winning the argument than “the most extensive discussions on general themes." 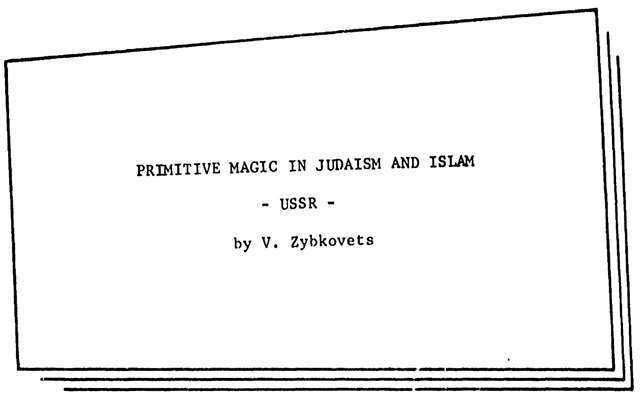 In this article published in the Soviet journal Agitator, the Russian author argues that while both the Torah and the Koran warn believers to eschew any form of magic, both Judaism and Islam were in fact imbued with magic and witchcraft. He cites chapter and verse from both sacred books to bolster his thesis. He posits that the Jewish elders of old practiced a sort of magic and held their secret practices tightly in order to establish a power over younger members of the tribe and thereby assure themselves of food, shelter, and protection. He gives somewhat shorter shift to Islam with fewer textual references. His focus is more on contemporary practices of Muslims in the Soviet Union and their belief in the efficacy of making pilgrimages to the graves of prophets in order to seek intercession and relief from illness and misfortune. 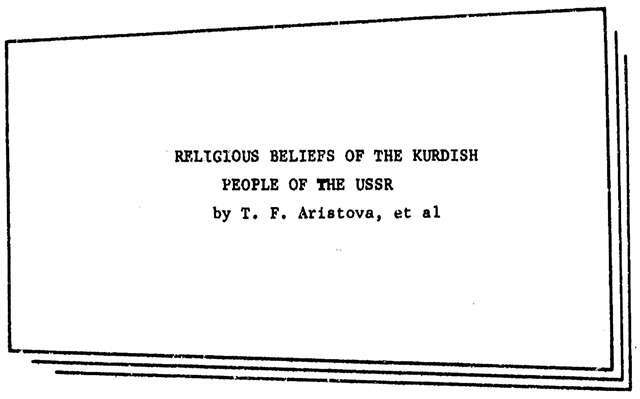 This report details the religious beliefs and practices of various communities of Kurdish people living in different republics of the Soviet Union. For the most part the author writes in a disinterested manner about these beliefs, including those of several different cults ordered around a single aspect of nature, such as lakes, trees, or a single concept like ancestor or fire worship. He also explores the role of dervishes in several communities and their beliefs and practices. He becomes less disinterested as he begins his conclusion that younger Kurds have increasingly benefited by growing up in a socialist system and embracing the new society free of superstition. Published in the Russian-language newspaper Soviet Moldavia, this article offers an anecdotal account of one young boy who has committed himself to the Baptist sect in a rural village. We learn that this once bright, enthusiastic member of the Young Pioneers now hides its red scarf rather than wear it proudly. He has lost interest in school to the point of truancy. This specific case is used to illustrate the larger problem of Soviet society in elevating atheism and denigrating religious belief. The moral position of the authorities is that religious belief promising a better life after death will sap the will of a person to contribute to establishing a just and vibrant Soviet society. Teachers and other authorities are encouraged to work harder to bring the children to atheism. Published in a Russian-language newspaper under the headline “What Do the Quiet Ones Want?” this article discusses a schism in the Soviet Union within the Baptist Church which includes sects that choose to proselytize in apparent violation of the law. The writer is generally dismissive of these sectarians and regards their leaders as more likely to fleece their flocks than they are to lead them to better, happier lives. Rather, as these religious leaders emphasize their own religious conflicts, they heighten the perception of their anti-Soviet and anti-social hostility. The author complains that in their opposition to Soviet law governing religion “they stimulate fanaticism and encourage protests against [the government] and instigate lawlessness."